In a large skillet, heat the canola oil until shimmering. Add the ground beef and cook over moderately high heat, stirring occasionally, until browned and cooked through, about 8 minutes. Add the taco seasoning and 1/2 cup of water and cook, stirring occasionally, until the meat is coated in a light sauce, about 3 minutes. Season the spiced beef with salt and pepper. Let cool completely. Spread the spiced beef in a 9-by-13-inch glass or ceramic baking dish. In a medium bowl, stir the refried beans with a generous pinch each of salt and pepper until smooth. Spread the beans on the beef. Spread the sour cream over the beans, then sprinkle the cheese and tomato on top. Halve and pit the avocado, then cut it into 1/2-inch dice. Scatter the avocado, jalapeño and cilantro on the dip and serve with hot sauce and tortilla chips. 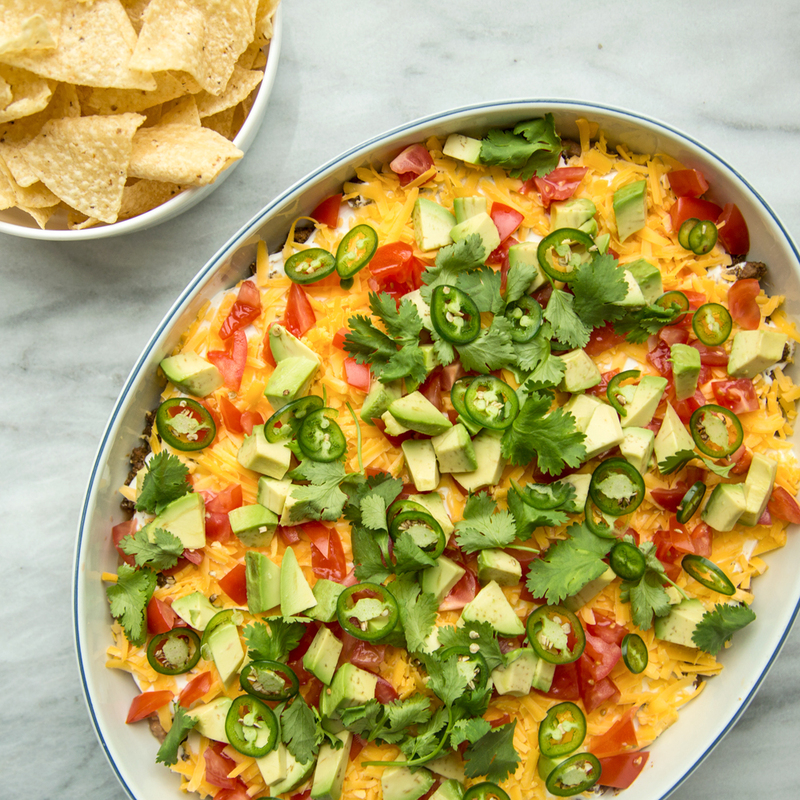 The taco dip can be prepared through Step 2, covered and refrigerated overnight. Add the avocado, jalapeño and cilantro just before serving.